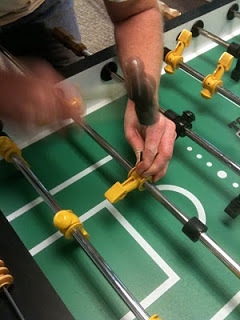 Removing your foosball men from the rods/bars can be a scary task if you have never put together a table or taken one apart before. In reality, though, disassembling the rods from your table isn't that difficult. Disassembling each rod will take approximately 1-5 minutes depending on how many men on are the rod and how good you are with a hammer and pin punch. Before we explain all of the details on how to take these men off, please note that some situations may not call for removing the men and rods from your table. If you are planning to take your men off to simply move your table, you may not need to go through all of the trouble. Consider just taking the legs off your table and carrying it sideways to get it to fit through doorways. This could save you a couple hours of taking the men and rods off and putting them back on the table, not to mention the unnecessary wear and tear this puts on your foosball table. Removing the men and putting them back on can be hard on your table because it could cause little shavings to break off on the men and rods, rod bending, or potentially broken parts if you aren't careful. However, if one of your men is broken you will need to take the entire rod off and reinstall it. This article focuses on how to remove a guy on a modern table with a pin that goes through the center. If your table uses screws, the process might not require a hammer and pin punch to get the man loose from the bar. Broken men are not very common unless you have an older table that has seen some wear and tear over the years. Men can be purchased individually or in pairs online and can be easily replaced if your man breaks in half or breaks on the toe. Start by laying down a piece of cloth or a towel down directly on the table to catch the little shards of the rod that will fall off as you are installing the new man. This will make it easier to clean and maintain your table. You will need a foosball pin punch tool that you can place inside the pin in the center of the man. The pin is the foosball part that holds and attaches your man on the rod. Then place the bracer block that came with your table between the rod and the table. This block will help prevent your rod from bending or warping while you hammer out the old pin. Hammer the pin completely out the other side and remove the rod from the table by repeating this process with the other men along the same rod. Removing the other pins along the same rod will allow you to slide the broken man off and the new replacement man on. Simply slide your new replacement man on and hammer the pins back in place. You may want to also replace the foosball pin along with your man, as the pin may have weakened and caused the man to break. Foosball men can be really expensive if you have to replace all 26 men with a 3 man goalie setup and 22 with a single goalie setup on your table. However, if you just need a couple guys that have broken over time, you can pick up individual men for about $4-6 each online, depending on the type of man is right for your table. Due to the high price, it is not recommended to purchase a table without counterbalanced men and try to upgrade your table later on. Make sure you review the table features of the foosball table before you make a purchase to see if it comes standard with the counterbalanced option.